Picnic at Pt Leo today with mum, ahhhh pure bliss! We have been talking about doing this sort of thing for years and today we turned words into action. And boy were we blessed – the sun was shining, the waves lapped on the shore (and threatened to overtake our picnic as high tide arrived) and the temperature was a stunning 17 degrees (very mild for winter). And I ate far too much of mum’s egg & bacon pie, not to mention the asparagus, pickled dills, fresh bread rolls, cheese, pickled sweet red capsicums and an entire French vanilla slice! But the most incredible thing happened, which left me with no doubt that God is so good and if he can take care of the little things then he is certainly on top of the big things! We passed the Moorooduc Coolstores on the way, which are being renovated, and will soon have an Endota Spa opening there. Mum and I joked about putting money in a jar to save up for a massage – well we know our big Daddy was listening. When we arrived at the beach, a friend who happens to own an Endota Spa in a lovely area, sent a message offering free massages tomorrow at her spa as she is training a therapist. I was stunned, amazed in fact. Long story short – Mum and I are meeting for another little picnic tomorrow then heading off for a free, hour-long massage! As much as I adore these patent bright pink Nine West heels they just don’t mix with sand. This was just a little glam up to show you an outfit alternative to the high-tops. Worked them with a Sportsgirl skirt and denim jacket, and Caroline Morgan pink knit which is peeking through a perforated knit. And now you’re Looking Good Girls! “Our barns will be filled with every kind of provision. Our sheep will increase by thousands, by tens of thousands in our fields; our oxen will draw heavy loads. There will be no breaching of walls, no going into captivity, no cry of distress in our streets. Blessed are the people of whom this is true; blessed are the people whose God is the Lord,” Psalm 144: 13-15. 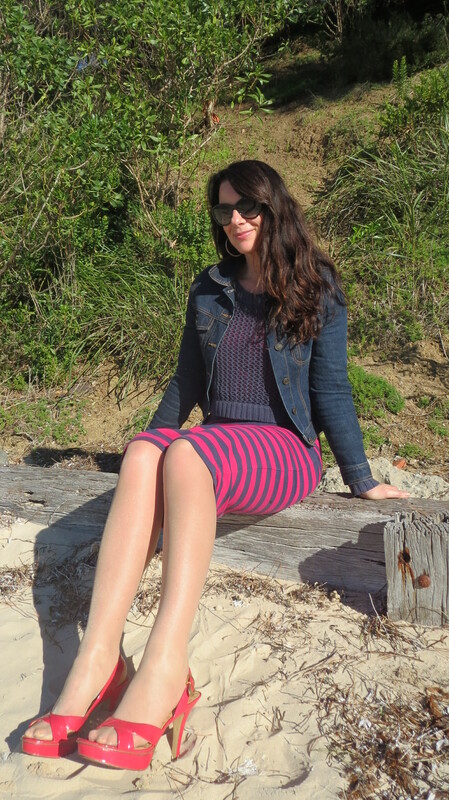 Love your stripe dress…. wish you had take the sweat off so as to see the full dress…. lovely pictures. Thanks sweety. It’s a skirt! Will rock a dress tomorrow. oh! didn’t know cos it looks more like a dress.